The Red Solstice has garnered a lot of support online, smashing its Kickstarter and gaining the green light for production. Just a quick search shows how excited the community has been about the product becoming reality, but somewhere along the journey of hype and excitement something has gone terribly wrong, for the Red Solstice (which, granted is still in beta) is currently a lonely, buggy venture through dark and sombre space. In the Red Solstice you play as one of eight space marines sent to find out what happened to human colonies on Mars who have lost contact following a violent storm dubbed the Red Solstice. Queue enemies en masse as you and your team fend off swarm after swarm of aliens, reanimated corpses and giant monsters in a test of survival. 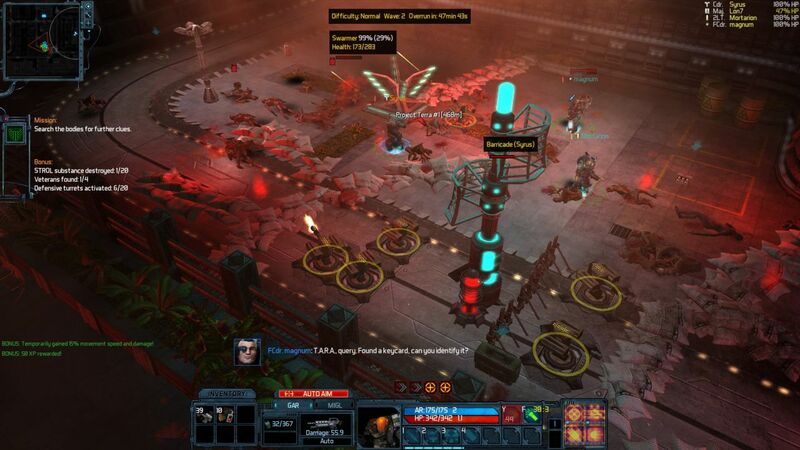 Starcraft players will recognise it as nod to the popular Night of the Dead, and while it takes pieces of the aforementioned mod, it is indeed a full game with both online and single player modes to keep you occupied. 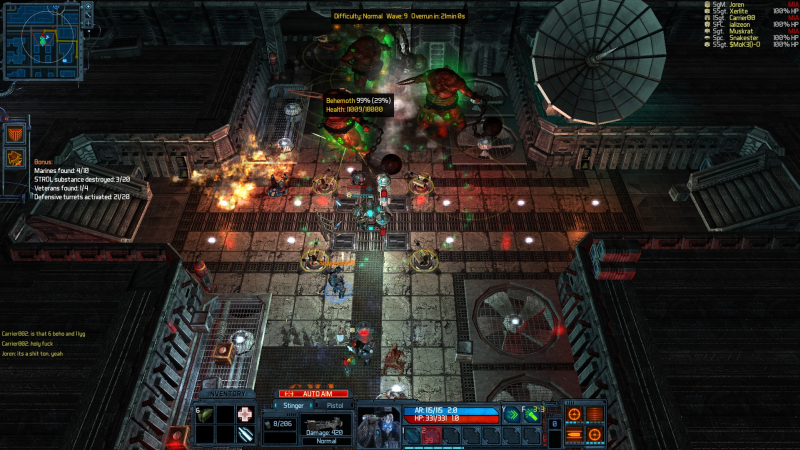 The Red Solstice is an intense and difficult top down tactical shooter; be prepared to die several times before you get to grips with everything. It’s not that it’s overly hard to learn, it’s just that the enemies can be unrelenting and too powerful for new players to handle, and it’s not until you begin to unlock better weapons and abilities that you can fully enjoy your experience. That being said, the Red Solstice plays well and the gameplay suits the premise and setting; you have to think tactically to survive, and the requirement to keep your eye out for more ammo and better equipment adds to the feeling that you’re merely dragging out your life rather than surviving. Different classes boast different abilities, and a selection of weapons are at your disposal to fully kit yourself out to suit your play style. While the gameplay and setting are strong, the games problems lie elsewhere. Even as early on as the prologue mission I was experiencing issues. Several bugs required me to restart the mission over and over, from barrels I needed to pick up already been blown to my weapons simply not firing, it’s a frustrating slog at times. I also experienced crashing at several key parts of the single player that required me to backtrack as well as a whole host of texture popping. While I can forgive most of these issues and I completely understand the game isn’t finished yet, I personally feel that the title should have been held back until such issues had been addressed. Sadly though, it isn’t the bugs which are my main issue with the Red Solstice; it’s the completely void of life multiplayer, the game’s biggest selling point that is my main gripe. The largest amount of players I’ve had in a squad so far is three out of the possible eight. At first I put it down to time zone differences, seeing as I’m from the UK and I guessed the majority of players are from the US, but even when firing the game up late at night it’s still pretty sparse, and what games I could connect to simply weren’t very fun. The few players I met were mostly elitists and not very welcoming and made it very difficult for a new player to actively want to play the game. It’s sad that players take it seriously to the extent that it ruins the game for others, but that’s the experience I had while playing the Red Solstice. That aside online seems like it could be a lot of fun with a full team with the right players, as the gameplay is still as frantic and heated as it is offline. While the maps are set out in hour-long fights for survival it’s great to see the inclusion of different missions to keep it fresh and exciting, and the game rewards players for completing these bonus objectives with unlocks and new equipment, but it currently isn’t enough when their isn’t much reason to keep coming back. If you’re interested in the Red Solstice hold off until later in its production. The current problems with bugs and a toxic, sparse community are crippling what could become a fun online experience and leave little to warrant the current price tag. Hopefully the issues can be addressed and the community improves as the game enters its final stages of production, but this early access version is a lonely broken affair. All in all, I feel it’s unfair to give a review for the Red Solstice as a final piece, but as far as reviewing it as an early access game, you’re better off sticking with Starcraft’s Night of the Dead mod until the Red Solstice can hold its own. Richard Banks was given free games by Brash Games in exchange for his reviews. As such all reviews belong to Brash Games and must not be reproduced under any circumstances. (© 2010 - 2017 All Rights Reserved). I’ve been keeping an eye on this as it does look interesting, but as you’ve said multiplayer (the key factor) is fairly dead I’ll be doing as you suggest and holding off until later!